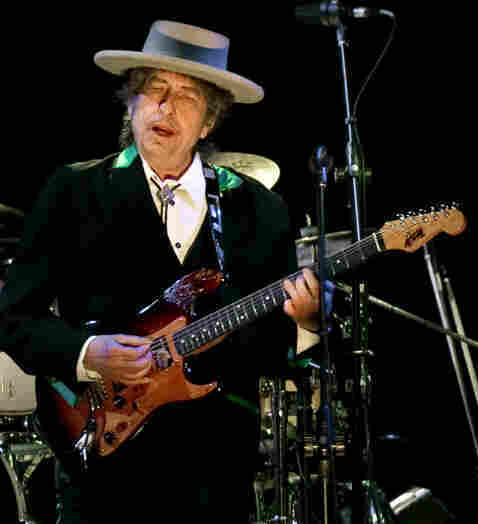 Bob Dylan Is Songwriter Of Choice For Freewheelin' Justices : The Two-Way When it comes time to put some style into court opinions and legal briefs by plucking a line or two from a songwriter's oeuvre, Bob Dylan's lyrics are by far the No. 1 pick of justices and law clerks around the nation, the Los Angeles Times writes. When it comes time to put some style into court opinions and legal briefs by plucking a line or two from a songwriter's oeuvre, Bob Dylan's lyrics are by far the No. 1 choice of justices and law clerks around the nation, the Los Angeles Times writes this morning. Even Chief Justice John Roberts and Justice Antonin Scalia, two men you would not think of in connection with the writer of many of the 1960s' best-known protest songs, have done it. "Combed legal databases [in 2007] to identify lyrics in court filings and scholarly publications, finding Dylan cited 186 times, far outpacing the rest of the top 10: the Beatles, 74; Bruce Springsteen, 69; Paul Simon, 59; Woody Guthrie, 43; the Rolling Stones, 39; the Grateful Dead, 32; Simon & Garfunkel, 30; Joni Mitchell, 28; and R.E.M., 27." "To know which way the wind blows." And why is Dylan a favorite of those in the legal world? "Being a judge is a pretty cloistered existence, having to crank out these opinions in isolation. Dylan was popular at the time they were coming of age and trying to figure out who they were," Long tells the Times. "The chance to throw in a line from your favorite artist is tempting, a chance to let your freak flag fly."